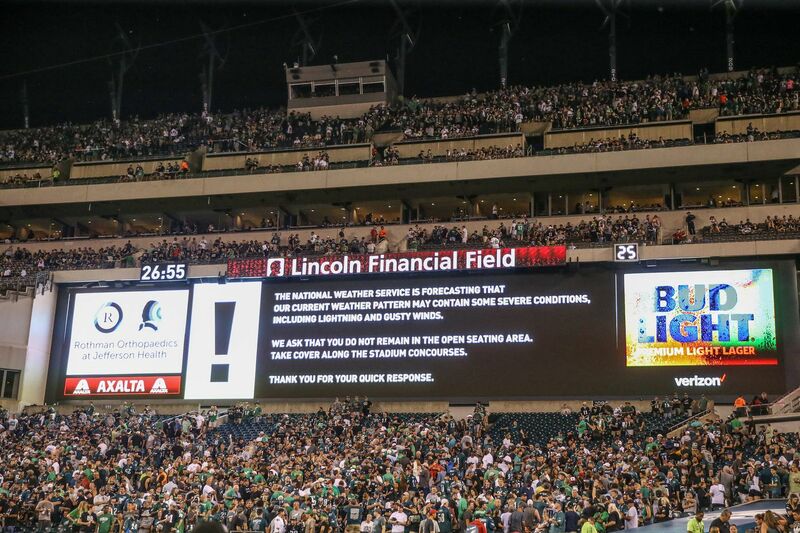 The Jumbotron in the southern part of the stadium flashes a sign for spectators to leave their seats and shelter in the concourse of Lincoln Financial Field until the storm passes. Fans at Lincoln Financial Field were in their seats by 7:30 Thursday night for the ceremony commemorating the franchise's Super Bowl LII victory — but soon they were heading for the exits. The National Weather Service was forecasting lightning and gusty winds, so the video scoreboards began showing, and the public address system began trumpeting, a request that fan head for the concourses. The Eagles and the Atlanta Falcons went to their locker rooms. Fans came here early for the pregame ceremony. They now need to enter the concourse. Weren't many empty seats 45 minutes before kickoff. Nat'l weather service is expecting lightning and gusty winds. And boy, was it wet. 2 hours ago: yayyy FOOTBALL BACK! With plenty of time to fool around, Eagles fans and alumni jumped on social media to start cracking jokes. The game didn't kick off until 9:05 p.m., meaning Birds faithful were able to celebrate that Lombardi Trophy for another 45 minutes. Even the Eagles' opponent jumped in on the fun. And finally, after the unveiling of the Super Bowl banner, the game was on. Read more of our Eagles coverage right here.